WBO junior middleweight champion Jaime Munguia 33-0 (26) was lucky to hold on to his belt with a majority decision victory over mandatory contender Dennis ‘Hurricane’ Hogan 28-2-1 (7) at Arena Monterrey in Monterrey, Mexico on Saturday night. 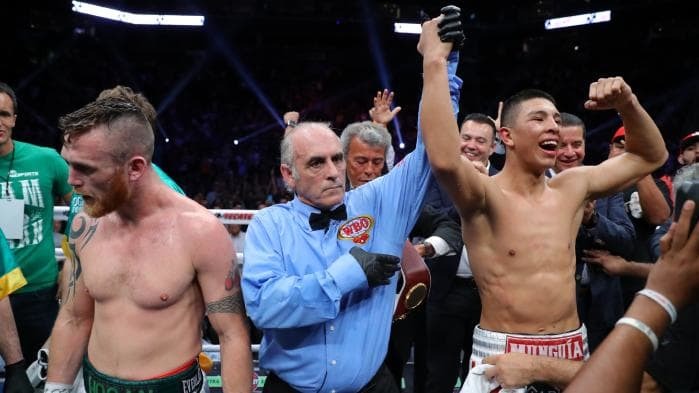 The 34-year-old Irish-Australian appeared to control much of the action but three ringside judges disagreed, awarding the bout to Munguia by scores of 115-113, 116-112 and 114-114. “It really hurts,’’ Hogan told The Courier Mail. “I worked so hard for this but I knew trying to win a decision against a Mexican hero in Mexico was going to be tough. Hogan is expected to lodge an appeal with the WBO. “We came here in good faith, and no disrespect to the people who scored it, but that decision shouldn’t go through,” Hogan said after the fight. “This is bad for boxing, bad for me, and a rematch is accepted right away, no questions asked. You saw the game plan. It was ‘keep moving and land more shots’. Every time I knew I was doing that. His power didn’t faze me at all because I’m moving, rolling with the punches, doing what I was doing. “He’s a great fighter, but I could see it in his eyes he knew he was losing. At times he was acting desperate. I wasn’t even worried that much, no disrespect, but I could take his shots and I was landing more than him. Munguia insisted he won the fight but conceded a rematch may be in order.